Niagara Falls is the place to weekend. Honeymooners, families and friends all find their way here to see one of the most impressive Wonders of the World. From casinos to wax museums, spas and water parks, Niagara Falls has something for everyone. Here are a few of our favourite spots to weekend while exploring this great Canadian city. Walk behind it, get up close and personal feeling its mist on The Maid of The Mist, or if you prefer, watch the fireworks and lightshow from the comfort of your hotel room. If you’re one for a little adventure, soar across the sky on the MistRider Zipline to The Falls. Each fully-guided experiences brings you 67 metres into the sky, gliding at speeds of 70+kph across 670 metres along the Niagara River. This is one of the most unique and coolest ways to see The Falls from up above. Spending time enjoying the beauty of this world wonder certainly should be on the top of your sight seeing list. ‘The’ luxury resort in Niagara Falls. Fallsview Casino Resort is a magical place as it’s said to be one of the largest and most elegant gaming resort facilities across the country. With a casino the size of 3 football fields, over 3,000 slot machines and 130 table games, there certainly is never a dull moment at Fallsview Casino. When you walk into the resort, you’re in awe of the beauty within. From high-end boutiques to impeccable restaurants, a luxury hotel and elegant spa, the Fallsview Casino was built on a cliff overlooking The Falls to wow guests from around the globe. Whether your spending the afternoon on the casino floor, or taking a liking to the luxurious king size bed, watching the falls thunder down below, life simply can’t get any better than this. Want to read reviews on casinos like Fallsview and check out beginners guides to playing casino games online visit online-casino-canada.ca. We all know your weekend won’t be complete without a round, or two, of golf at one of the impeccably designed golf courses in Niagara Falls. With 1,000 acres of natural beauty, two 18-hole championship courses, a unique 45-acre, 360-degree driving range and a short 9-hole course, Legends on the Niagara ensures every moment on the greens is a memorable one. With courses were designed by renowned golf architects Thomas McBroom and Douglas Carrick, Legends is one of Canada’s premier golf courses, and certainly one you’ll want to visit if you love an early morning tee-off. As you stroll up and down and around Clifton Hill, you will feel the high-vibes the street has to offer any weekender. Feel on top of the world as you embark on a journey on the Niagara Skywheel towering 175 feet in the air. The Skywheel is one of the greatest places to capture the natural beauty along the horizon from up above. Other notable spots to explore on Clifton Hill are the plethora of wax museums, haunted houses, the Great Canadian Midway and some pretty amazing restaurants. Exploring the likes of The Falls on foot all weekend calls for a relaxing Sunday afternoon at the spa. Immerse yourself in a little bit of rest and relaxation at one of the many spas the area has to offer. Serenity Spa provides the perfect place to kick back and relax. We love the Waterfall Bliss Signature Facial, to brighten and revitalize our complexions through deep hydration and re-mineralizing of the skin, certainly a must do while in the city. If you’re traveling with little ones, we highly recommend spending the afternoon at one of the coolest indoor water parks or outdoor themeparks found around town. If you’re staying at Great Wolf Lodge with the kiddos, then you’ve hit the jackpot with its massive indoor waterpark that will literally have you in awe of every unique slippery sliding detail they’ve thought of. Fallsview Indoor Waterpark comes in at par with the Lodge, with 16 waterslides, a mammoth Beach House Rain Fortress with a 1000-gallon tipping bucket, and best yet, adult-only hot tubs. If being outdoors is more your thing, explore Safari Niagara and get up close and personal with some pretty amazing wild animals. 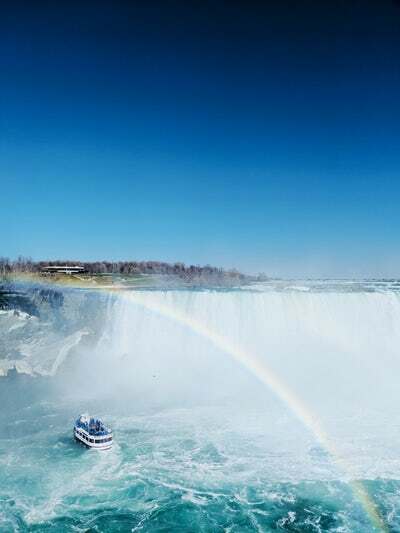 Whether you’ve came to see the Wonder of the World, the magic of Clifton Hill or prefer to test your luck at winning the jackpot Niagara Falls is quite possibly the most unique city in Canada that should be on everyone’s bucket list.